Fluke was a gift from my best friend, and he is a funny cheeky boy full of life and fun. Flukey can always put a smile on my face. He is my first ever boxer and he is a great ambassador for his breed. Loyal and devoted, he has been a wonderful addition to the household. He gets on famously with the other dogs and loves running free on the edge of town. I hope I have many more years with this fun loving boy. 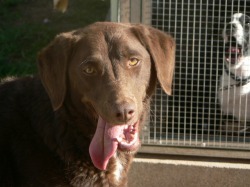 Rasta was adopted from Albury Dog Recue, he came from Wodonga pound. Rasta is a big boofy bullmastiff/staghound cross boy. He weighs around 50kgs so he is a large dog. Great with other dogs, and good with cats as well, Rasta has fit in really well too the existing pack structure. He is a big clumsy oaf at times but very lovable and affectionate. I look forward to having this big gentle soul for many years to come. 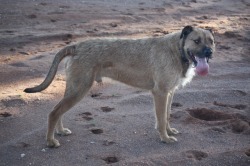 Sultan was purchased from Maybri Kennels in Port Pirie SA as a 2 yr old desexed pet. He was my first IG and thanks to him I have now fallen in love with this breed. 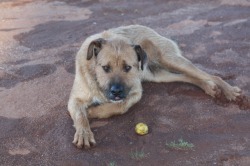 Sultan is a happy easy going boy who gets along with everyone, and loves to play with the other dogs. Sultan has gone to live a life of luxury with Cath in Qld, as he was growing weary of being with young boisterous iggies. 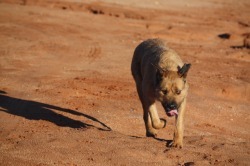 Chilli is a kelpie X curly coat retriever who I adopted as a 12 week old puppy from the RSPCA here in Broken Hill. She is a ball mad super active little dog who is also my shadow. Chilli LOVES water and will wallow in her pool no matter how cold the weather! She travels to dog shows with us and is a lovely natured dog. She is best friends with Karma and they do everything together. 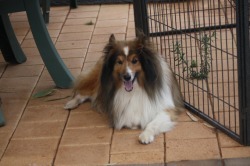 Wally found himself on death row in Albury pound after his elderly owner died and the family did not want him. I couldnt stand the thought of this lovely old boy being left to die after being his owner's faithful companion for so many years. So Wally came to live with us at Karindi. Hes deaf as a post, has failing eyesight, a gimpy leg and a touch of dementia, but hes a lovely old soul. Wally is a happy affectionate boy who doesnt ask for much - food in his belly and a warm bed. So for however long Wally has left he will remain here being showered with tlc. Old dogs make the best pets!